Hotel Calipolis is located on the beautiful seafront promenade of Sitges. The town in Spain is one of the most quaint yet cosmopolitan beach towns in the country. Situated to the west of Barcelona, you’ll find restaurants and boutique shops aplenty as well as lovely beaches. The hotel has a swimming pool with a sun deck where guests may bask in the sun and enjoy the gorgeous sea views. The hotel is situated right by the popular gay Sitges beach too and also in the heart of the town. At the Bar Del Mar you’ll find arguably the best terrace in Sitges with its splendid views of the promenade and the sea, as well as an excellent tapas menu. The hotel gym, the room service menu and the delicious buffet breakfast to start each day augment the hotel’s facilities. 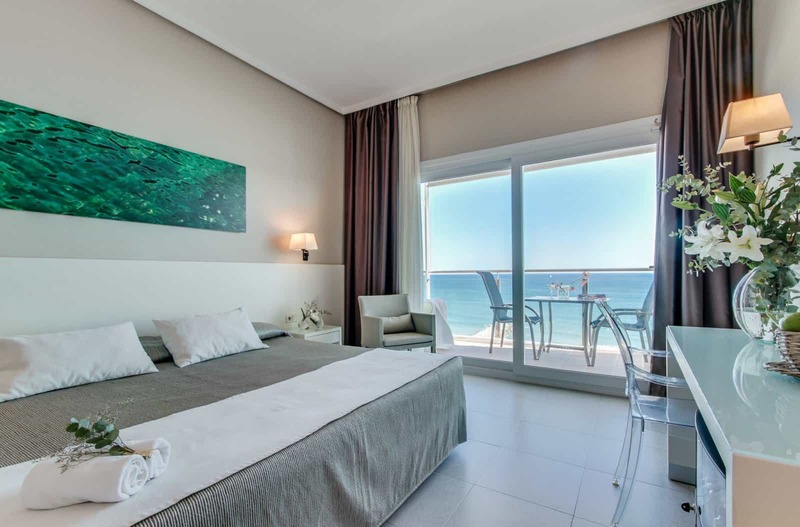 Each room has a sea view, overlooking the beachfront and is accompanied by a private balcony with views of the Mediterranean. The spacious and quiet room commands views of the neighbouring mountains. The hotel’s junior suite rooms offer more space with a large bedroom with a Queen-size bed, living room, and a larger terrace, fully equipped for sunny days. Enjoy outstanding sea views and classic Mediterranean cuisine at this popular restaurant. You can also peruse the high-quality wine list. Boasting sea views and a terrace overlooking Sitges promenade, you can tuck into a range of Mediterranean dishes. Sitges is a great place to party, and starting your night at Infinity Bar is always a good idea. You can have a drink on the terrace overlooking the pool; as well as enjoying a range of quick light bites throughout the day.